1. Mychal Kendricks – Inside Linebacker – University of California. Mychal Kendricks is an interesting prospect at ILB. Many people write him off as an ILB because of his height, he is listed at 5-11, which is small for an inside linebacker. However, he has a big base and weighs an astounding 240 pounds and shows great balance. Furthermore, his greatest asset is his quickness. On tape, Mychal shows impressive range against the run. If the Chief’s were to draft Mychal the front seven would immediately be more athletic and he shows the potential to be a three down linebacker. Kendricks is a very physical linebacker that adds tenacity to a defense that needs to get more “nasty”. 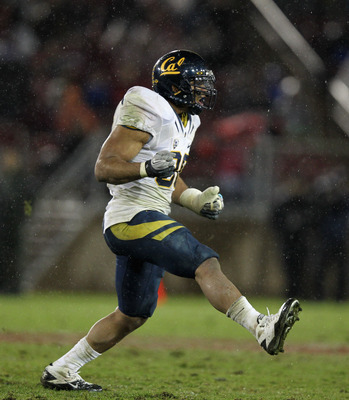 Furthermore, Kendricks can lay the lumber on opposing ball carriers as he did in his career at Cal. 2. Kevin Zeitler – Offensive Guard – University of Wisconsin. Kevin Zeitler is the third best offensive guard in the 2012 NFL draft. What puts Kevin in the second round is that he could start at guard during his rookie year. Kevin has to be considered by the Chiefs since they have recommitted themselves to running the ball in 2012. Kevin projects as an above average offensive guard who could step up and contribute immediately. 3. Alameda Ta’amu – Nose Tackle – University of Washington. Alameda Ta’amu fits the mold of a perfect 3-4 nose tackle. He is 6’2″ and 348 pound and shows the ability to dominate one on one blocking situations. Alameda constantly demanded double teams at Washington and significantly improved his dominance at the point of attack between his junior and senior season. If the Chiefs draft Alameda Ta’amu, they are saying that the progression of last years six round pick Jerrel Powe is not where they want. 4. 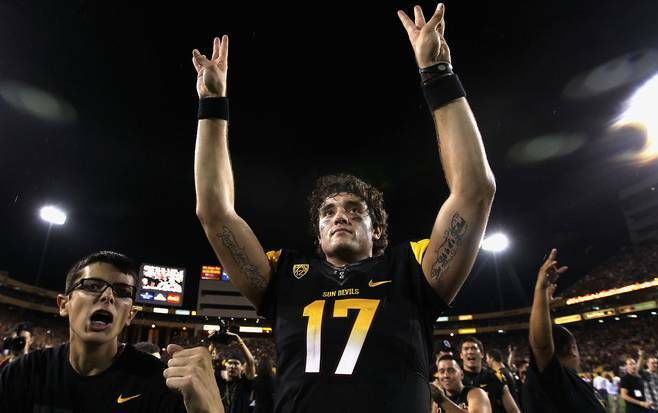 Brock Osweiler – Quarterback – Arizona State. Brock is a wild card pick for the Chiefs. The Chiefs are in desperate need for a quarterback with the upside to be a franchise quarterback. Brock provides the upside to be a franchise quarterback do to his arm strength. Brock, standing around 6-7 surprisingly shows great mobility for a player that big. Also, Brock shows the ability to make all the NFL throws, but must improve his throwing mechanics. A major question that scouts have had on Osweiler is his accuracy, much of his problem comes from him mechanics. Brock is your classic boom or bust quarterback prospect, but if handled right and given time to learn from the bench, he has a chance to be a great NFL quarterback. 5. Trumaine Johnson – Cornerback – University of Montanta. Trumaine has been linked to chiefs recently and is supposedly visiting the Chief’s this week. Trumaine Johnson has all the tools to be a potential shut down corner in the NFL. He has the size at 6-2 and shows fluidity that is rare among cornerbacks with his size. However, right now Johnson is nothing more then athlete playing football. If the Chief’s were to draft him he would probably not contribute for a couple of years. Trumaine is another classic example of a boom or bust prospect. The cornerback position has good depth which would give Johnson the time on the bench that he needs to develop. Also, do not be surprised if the Scott Pioli and the Chiefs trade down or up to get a player that fits the teams system. This entry was posted in Football, Football, Home, Midwest, National and tagged Brock, Kansas City Chiefs, NFl Draft, Osweiler, Scott Pioli.